Friday July 8 1910 I washed a few things in the morning and did cleaning of porches with the water. Did churning and ironing. Will went to town in afternoon. After supper I've got ready and Will took Art [illegible] rig and I ours and went down to meet the folks at the 11.45 train. Stopped with Mother & Hattie awhile It has been a frightful hot day. They came on time Vera & I rode together and Harry and Will. 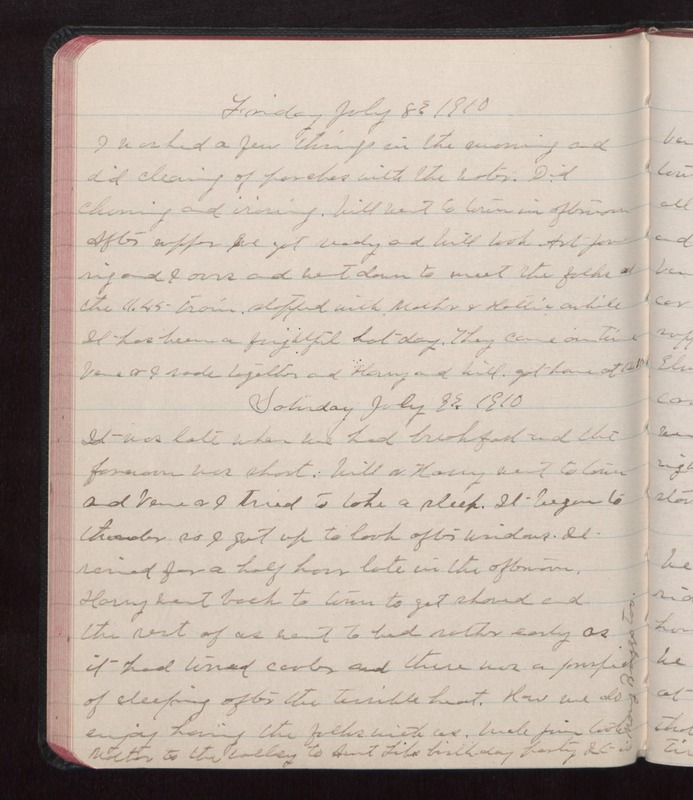 got home at 12.10 Saturday July 9 1910 It was late when we had breakfast and the forenoon was short. Will & Harry went to town and Very & I tried to take a sleep. It began to thunder so I got up to look after windows. It rained for a half hour late in the afternoon. Harry went back to town to get shaved and the rest of us went to bed rather early as it had turned cooler and there was a [illegible] of [illegible] after the terrible heat. How we do enjoy having the folks with us. Uncle Jim took Mother to the [valley?] to Aunt Lib's birth-day party. It is Mary Briggs too.